Verint® is a global leader in Actionable Intelligence®, which has become a necessity in a dynamic world of massive information growth. By empowering organizations with crucial insights, Verint solutions enable decision makers to anticipate, respond and take action, and make more informed, effective and timely decisions. Our solutions are designed to address three important areas of the actionable intelligence market: customer engagement optimization; security intelligence; and fraud, risk and compliance. Verint’s vision is to create A Smarter World with Actionable Intelligence®, and today, more than 10,000 organizations in over 180 countries—including over 80 percent of the Fortune 100—already benefit from this vision. Learn more at www.verint.com and NASDAQ: VRNT. Today’s customers have high expectations—and that means organizations must be ready, willing and able to anticipate their requirements, deliver sales and service through an array of channels, and support them in a way that’s consistent, contextual and personalized. That’s where Verint Customer Engagement solutions can help. 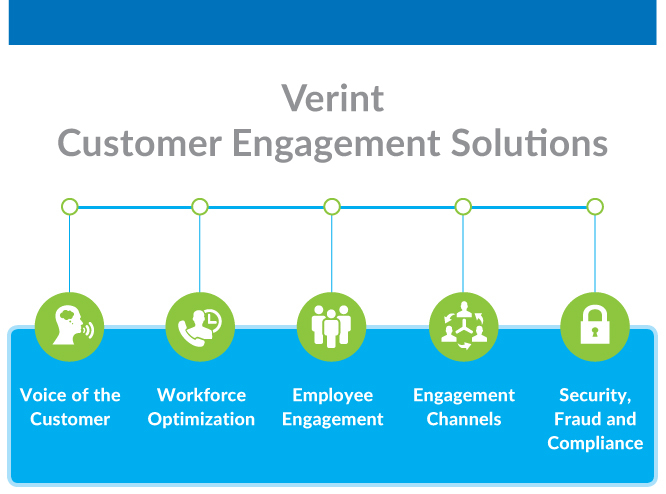 Verint offers a comprehensive portfolio of software and services that bring together proven solutions for voice of the customer, workforce optimization, employee engagement, engagement channels, and security, fraud and compliance. Deployed in the cloud or on-premises, these solutions can help your organization engage and empower customers—and employees—more effectively, while offering valuable insight for delivering better service; improving products, processes, and performance; protecting personal information; mitigating risk and fraud; and helping ensure compliance. By empowering your employees with information that can be shared enterprise-wide, you can break down silos and engage your customers and staff in a highly effective, consistent way. Today, thousands of organizations around the world rely on Verint solutions to enhance customer engagement and customer loyalty, maximize revenue opportunities, generate operational efficiencies, reduce cost, and mitigate risk. Learn how Verint solutions are helping organizations around the world uncover business trends, discover the root cause of employee and customer behavior, and power the right decisions to help ensure service excellence. Keep up with the latest happenings at Verint. Take a closer look at how Verint’s solutions can benefit your business. Gain insight from customer engagement optimization thought leaders at Verint. As the WFO Market Evolves, Will Vendors Adapt? Should CSRs Be Paid for Performance? Verint: Can I Get a Witness?